I am currently knee deep in my Chanel Jacket Muslin fitting. 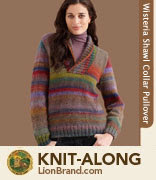 Recap: Pattern: V7975, short version with no overlap. Initial Pattern Issue: This pattern does not have the 3 piece sleeve that I want and none of the other patterns with a 3 piece sleeve are in print. 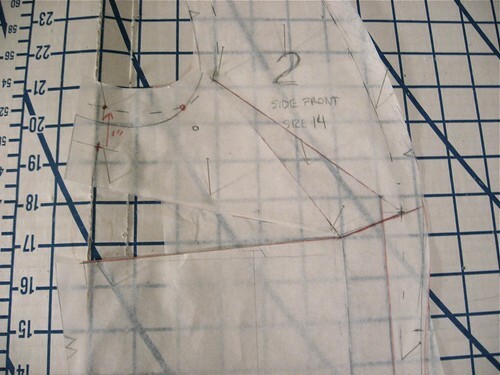 I even enlarged the diagram from the Great Sewn Clothes book and printed it out to scale to see what I could glean about the fit and attempted to redraft a sleeve for my pattern taking these details into consideration. I was obsessing a bit much about it so I asked my sewist friend Sara of and Sparrows and Honey Bees for her advice. 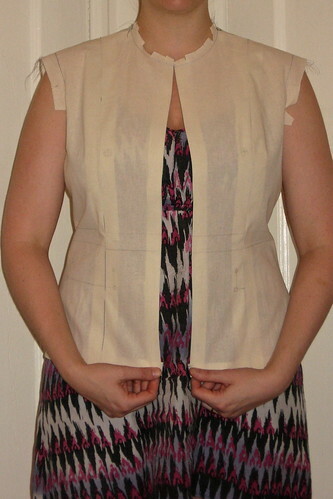 She assured me that I 3/4 length 2 piece sleeve would be fine and appropriate for a summer jacket. I'm still thinking about it, but I'm probably going to take her word for it and keep working on the sleeve pattern puzzle for a wool boucle winter version. Muslin #1: Like a good little apprentice couturier, I made a muslin. 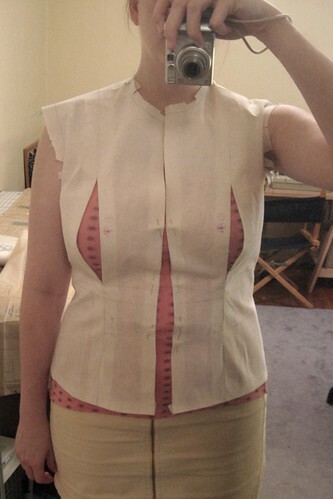 I started with size 14 according to my high bust and I knew I would need to lengthen it so I added 1” to the bodice and sleeves prior to cutting the muslin. 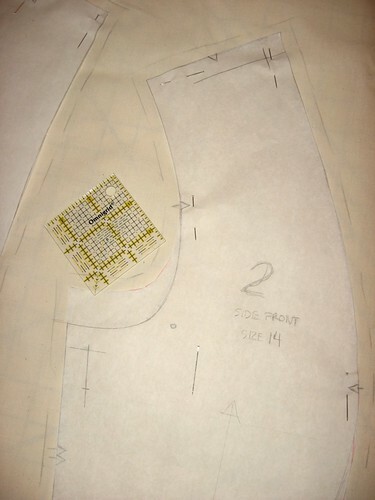 According to my research the classic Chanel jacket has very high armholes, so I also raised the armholes 1 inch (but traced out the original armholes for comparison) and only inserted one sleeve. 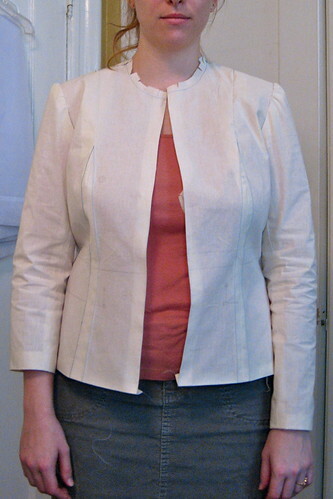 I sewed it up with 1" seam allowances and tried it on. 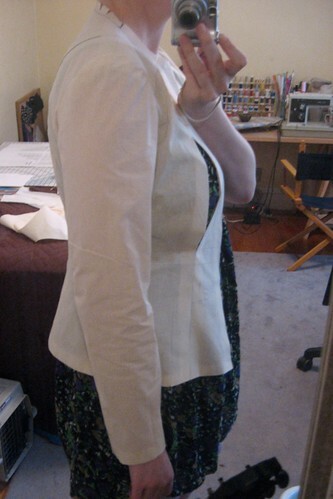 The armhole fit is good although the bicep may be a tiny bit snug (still contemplating that). I'm happy with the way the back fits. The one issue I have is with the front. Obviously, I need a FBA. Muslin #2 I followed Fit For Real People’s approach to the princess seam FBA. 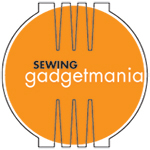 FFRP offers 3 options for FBA on the princess seam: adjust the front piece, adjust the side front piece, or if the adjustment is very minor one can just add to the princess seams. For larger adjustments (ahem DD over here) FFRP has you choose based on the how far apart or close together ones bust apex is. The idea being that the princess seam should fall on the apex. 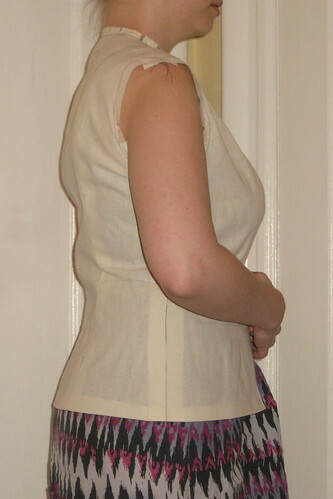 My bosoms must be pretty well centered because they were already on the princess seam (minus the 1” FBA needed). Unlike Erica Bunker. who adjusted the front piece, I opted to modify the side front piece. I spread the bust 1” for my DDs. 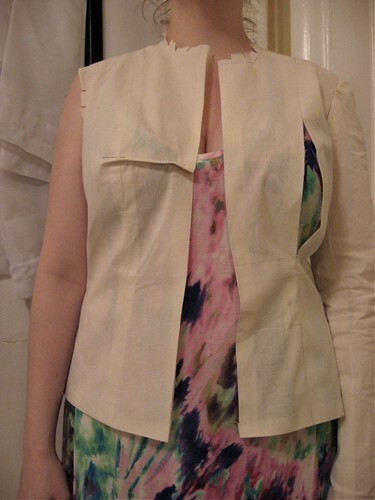 I was rather proud of my pattern modification and re-cut a side front and front muslin piece and attached them to the half of my muslin that did not have a sleeve. Result: the front piece is WAY TOO LONG, causing the CF to hang down and out. Because I spread my side front 1" I ended up adding 1 ½” length to the front piece which caused the front edge to hang down and swing away, and caused the CF to look curved rather than straight. Bummer. Problem solving: I pinched out 1” at the CF and tried to determine how to adjust the front piece to reduce the front edge length only but I was stumped. FFRP does not address the princess droop for an open jacket. 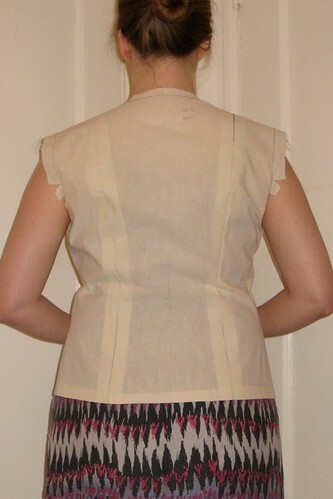 It only offers a solution for a dress which is to hack off any excess length at the bottom of the front panel, which is an inelegant solution (IMHO) that would not work for me here. I though real hard and as the hour of my bedtime drew nigh I began to fear going to sleep frustrated. In a moment of desperation I undid the princess seam on the other half of the muslin that had the original pattern and let out my seam allowances (1” muslin seam allowances are a MUST folks!) 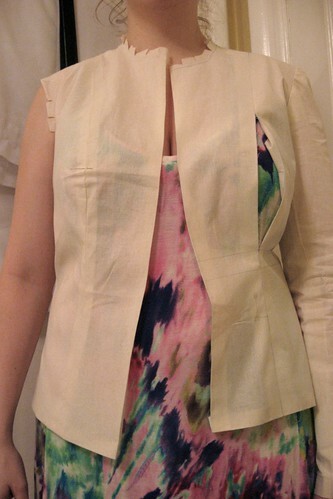 so that my remaining SA was ½” from the hem to the bust point and then tapered into the original seam. It worked. I had my 1” added width and My CF edge is straight. My hem is straight(ish) This FBA is way easier than the FFRP version. I think I'm going to let out the side seams below the waist about 1/8" and pinch in a bit of the front princess seams above the bust before I finalize my pattern revisions. I'm also still trying to decide about the sleeve length.... 3/4 length or long sleeve. 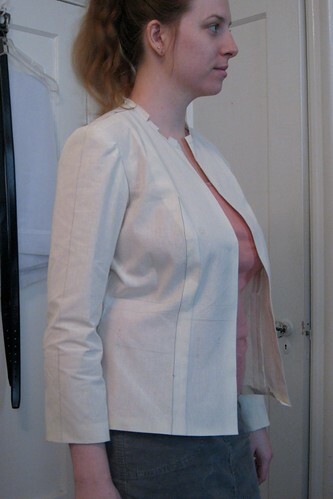 My BF likes the long, but as a summer jacket a 3/4 length would be just fine and I could always make this again as a winter jacket with a black wool boucle and long sleeves. I still want to try to figure out the 3 piece sleeve pattern (or find a copy of the Sandra Betzina pattern). Thoughts on my progress so far are welcome! Your muslin looks great! I think you look already stunning in your muslin jacket. I can only imagine all the hard work, as I´m very impatient :). Looking forward to the final piece! Hi, I may be a little behind, but I have to recently become obsessed with Chanel Jackets. Have you finished yours? I would love to see it. 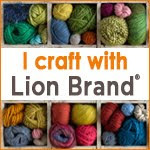 I ordered fabric from Linton Tweeds, so have a few nice pieces. I would love to share my version when finished. @Dragana - I actually put this away for the winter. It's amazing how my project mojo comes and goes. Now that the weather has turned I am anxious to get back to it. 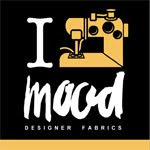 I'll be starting the quilting process soon and I hope to do a post on that. 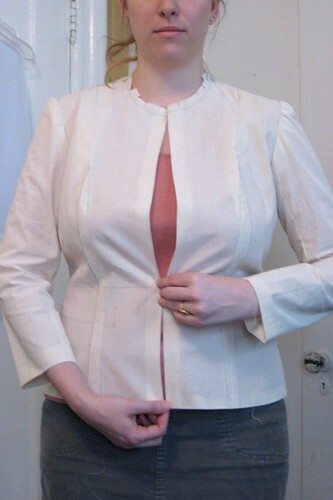 Check out my pinterst boards for some Chanel jacket photos I've collected.